How could one successfully tackle global challenges by presenting his research work to a standing audience of all ages and pass-byers in a shopping mall? 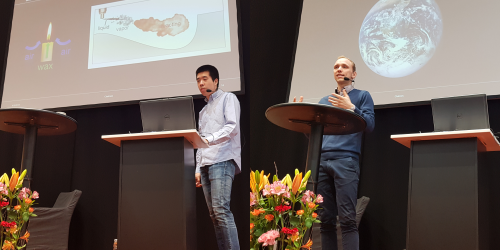 Mr Jiayi Zhou (ESR 2) and Mr Marco Fistler (ESR13) from Chalmers University of Technology managed to catch their audience’ s attention by talking about the European idea of international knowledge exchange and the importance of multinational collaboration in dealing with global challenges. 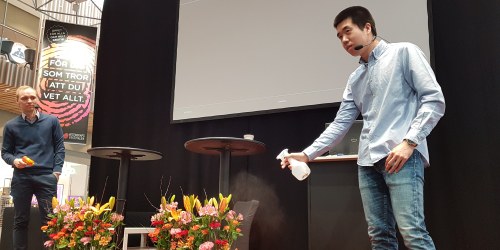 Their presentation was hosted by the International Science Festival in Gothenburg 2018 in the shopping mall “Nordstan” on the 18th of April. They explained how the HAoS project fosters collaboration between the participating institutes and the researchers and how this collaboration contributes to the research conducted. They also talked about engine spray combustion and the correlation between simulations and experiments. The audience wanted to hear more about the way HAoS combines experiments with simulations. It was also very pleased to know how the taxpayers’ money is used by the EC for the common good.